Why are vinyls out of stock most of the time? We are a very small team and can currently only take 25 custom record orders per week to maintain quality. This doesn’t include printed items. Check back Monday-Friday around 5pm ET as we add more in stock (around 5 a day) most days. This ensures we can work on getting your order to you faster! I ordered _______, can you have it done by __/__/__? What audio can I put on the record? Non Original Music: Read on..
Make exact copies of any album or sound track you don’t have permission/licensing for. Accept illegally obtained copies of audio. Such as ripped from YouTube, pirated audio, or peer 2 peer downloaded music. If you didn’t pay money for the audio, please don’t submit it, we will cancel the order. We want all artists to get paid. 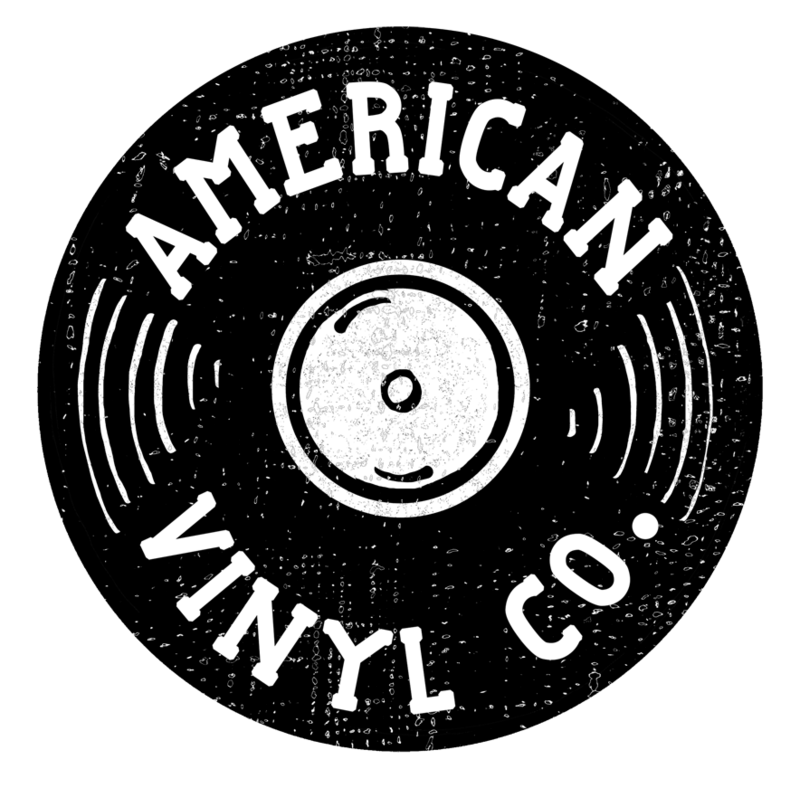 American Vinyl Co acts as a “transferring” service of YOUR audio. All the copyright liability is the responsibility of the customers. Repeat: All the copyright liability is the responsibility of the customers. This said, if you purchased audio from a legitimate distributor (iTunes, Google Play, Amazon) and you want to make a personal single copy of a mix of songs on an analog medium (vinyl) then there should be no issues (although, we do not guarantee this). Where do I get mp3s and how do I send it to you? Please use legal distributors such as iTunes, Amazon, Google Play etc..
To get us your music, please use the upload forms on the product page. They will not be visible when product is out of stock. We do not accept any liability of the audio you use to create your record, we are a transferring service of digital audio to vinyl medium for personal use. How do I see how long my playlist is? Easiest way is to create a playlist in Spotify or iTunes and they will tell you your total time. Be sure to do this for each side! Standard records are 17 mins max a side unless you pay up to 20. What audio do you accept and what is best? High quality WAV files will be best. **NOTE: if this converter creates audio issues and you submit those audio files with these audio defects we cannot accept responsibility! How much time does a 12″ record come with and hold? Our 12″ lathe cut records (doesn’t apply to pressed records) come with 34 minutes of audio standard which is 17 minutes per side. You can add up to 40 minutes with 20 minutes max per side. It is a dollar a minute more per minute which can be added on the 12″ Record product screen. Can I do a unique combo of your products? I am nervous about placing an order, will you help me with it if I need help? We know that vinyl is difficult to create. Please try to place an order first when product is in stock then email us if you need extra help! We will try and get back to you asap! I live in Asheville, do you have local deals? We do! You have to come by the shop in person to see these rates! 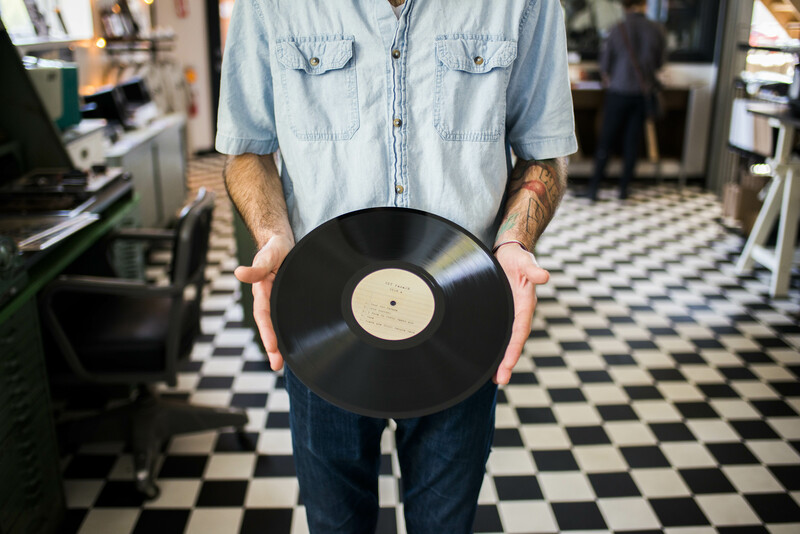 Whats the difference between your custom records and record pressing? Are these lathe cut vinyl records? What are those? Yes, they are lathe cut stereo vinyl records. Lathe cut means each copy is cut in real time on a record lathe. I don’t want to use the website, can I order over the phone? Because of the amount of orders we have to complete every day it is best to attempt completing the order then if you have additional questions send us an email, we will get back to you asap! I am in a independent band and we don’t have a lot of money, do you have cheaper packages? Yes! We have DIY hand cut options, pressed runs with black and white labels and covers, records only, etc.. We are touring musicians so we know the pain of income and how much we rely on making a profit at the merch booth. Remember, custom records are hand-cut custom records, not pressed, and you can use that to your advantage! Think an original painting vs. a print. There is a bigger discount when ordering a package compared to singles! If you are looking for unique pricing on record pressing and don’t see it on the site send us an email! Is there a limit on how many I can order? Do you offer download cards, printed inner sleeves, printed inserts, posters, etc? Yes! Please email or call us for your specific vision and we’ll make it happen! Cutting is included in our pressing packages and all masters are cut on a Neumann VMS-70 by an engineer with 20 years of experience. Order your songs with the loudest songs at the beginning and softest towards the end of each side. This is strongly suggested even if your order on CD is different than your vinyl release. Why American Vinyl Co for pressing? We are vinyl record experts! Not only do we help artists press records but we hand make custom vinyl records, packaging, and even record live to vinyl in the American Sound Truck in Asheville! We are proud to be the only public record cutting shop. Hate waiting for responses and feel overwhelmed by the process? We are always here to talk Monday-Friday via email or phone for any questions, updates, or advice to get vinyl on your merch table. Check out our reviews! Our pressings are all cut on a Neumann VMS-70, the grand daddy record lathe! We will make sure the process is simple, friendly, and quick! What is the max time for 7`` and 12`` pressed records? 45 rpm – 4.5 min. 33 1/3 rpm – 7 min. Recommended length is 22min per side or less. We can fit 25min per side but volume and low frequencies will be compromised. Who does the lacquer mastering for the pressed records? Printed covers are the protective outer jacket that has printed graphics or text, they make your record look good! Ours are 18pt THICK jackets with up to 600 DPI, only the best! How do I design my cover/labels? Make sure the background and or images extend into the area that says “Extend background or images into this area” but do not put main images and or text that you want on the cover as this will be cut off! If you don’t extend anything into the background, there will be white on the cover since nothing was extended and we can’t accept returns of covers if this happens. The front of the cover will be on the right side and the back on the left side. When you are done, you have to click “Buy Now”. If you don’t click “Buy Now” it won’t show in your cart and we don’t receive it! Ensure you check out all the way! Will you design my cover and labels? Are the printed covers made from my art? Do you offer rush service for an extra fee? We offer a I NEED IT NOW fee which is 75.00 (on top of your order). Rush orders will be completed in 1-2 days from when material is submitted and paid for. Can I order over 100 jackets? Yes, we can do 1-30, 300, 500, and 1000. But we can’t do 31-299, it’s complicated! Oh no! We are sorry to hear that. Please try the following before contacting us for a re-cut. I haven't received my record from USPS, can you send me another one? We don’t accept responsibility for USPS errors. Don’t worry, your package is fully insured! Can you recut my record? My order has been in ``Processing`` for weeks! What gives?? If I upgrade shipping will my order get made faster? Record players are KEY to good playback. Because all record players aren’t created equal, this can effect the way your record sounds and plays (compared to our hifi system). If you need suggestions on a new system feel free to ask! Dust can ruin the sounds of a record, keep your record clean with a carbon fiber bristle brush. Some songs will cut to vinyl easily and clearly, and others won’t. Modern music will be harder to cut because of the loaded high frequencies. So results may vary. Suggested to put loud modern pop music towards the beginning of the record. Can I add over 40 minutes? Anything over 40 minutes causes audio quality loss and lower volume. For custom records we do not cut anything longer than 20 minutes a side. Please get 2 records if you have over 40 minutes of audio. For pressed records you can cut up to 25 mins per side. Provide high quality formats such as WAV, 320 MP3, or other lossless formats (although we’ll accept most formats). If music is low quality, it will not translate well. Music without extreme bass or a lot of high end frequencies cuts better. Please don’t send us clipped music or music that sounds destructive to speakers. Less time = better quality and volume. Best translation will be around 15 minutes a side or less. Basic mastering is included! We will do our best to make sure there is good spacing, volume is even throughout, volume is a listenable volume, S’s are tamed, and more. Do these records play on regular turntables? Yes, with no adjustments needed. Play as well as a retail record! WARNING: some lower end portable players might have issues playing these records. Are your records stereo or mono? Why do some of the records cost as much as retail records or more? Simple: large manufactured runs vs. artistic creations. If you are looking for a ton of copies, pressing a record would be the right choice. If you are looking for a one off record, a short run of records for merch or special release, or a unique vinyl gift for someone special then we are your guys. Are the records lo-fi quality? No way! The records made here are high fidelity stereo records cut straight from our lathe. Are these the same as other Lathe Cut websites? Yes and no. As with all products, none are created the same because it is the operator and equipment that determine the quality you get. Also, these are not cut on vintage machines which have a limited frequency range and more surface noise. Our records have a full hi-fidelity frequency response and full stereo imaging.